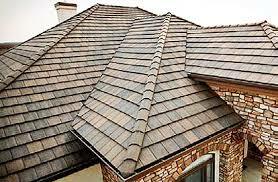 Tile roofs are both beautiful and durable. Clay tiles are a traditional roofing material that is used widely in the southwest, but concrete tile is gaining in popularity all over the country. Concrete tiles come in a variety of styles and colors and can mimic the old world charm of clay at a fraction of the cost. For more details on the differences between clay and concrete go you NRCA. Here are some points to think about when considering a concrete rile roof. Nature can produce storms powerful enough to damage any roofing material, but concrete tile roofs are able to withstand most of nature’s ferocity. Concrete tiles can sustain wind speeds of over 125 miles per hour and stand up to snow, rain, and hail. However, as the tiles themselves are an extremely heavy roofing material, excessive snow accumulation on your roof could put too much strain on the roof support. Both concrete and clay roof tiles are extremely popular in sunny climates because they help lower energy costs. Since they reflect light rather than absorb it, the sun heats the house less and less energy is required to cool it. In extremely cold climates, tile roofs can crack from freezing and thawing out. However, concrete tiles can now be made to withstand extreme temperature changes. One of the key selling features of this material is that it is extremely durable. It is fireproof, insect-proof, and weather-resistant. Some manufacturers guarantee concrete roof tiles for up to fifty years, and a properly installed concrete tile roof can last the lifetime of your house. While minimal upkeep is typically needed for concrete tile roofs, moss and mildew growing between the tiles can become a problem for homes in wetter climates. This problem can be avoided by washing your roof with a pressure washer once a year. Hail or falling branches can crack the individual tiles which will then need to be replaced. Depending on the type of concrete tiles you chose, the color can fade over time making it next to impossible to match replacement tiles to the rest of your roof. If mismatching tiles bother you, you can paint your cement tile roof with a heavy-duty acrylic paint. However, after painting your roof the first time, you will have to re-paint it every couple of years to keep it looking like new. The secret to a durable, low-maintenance concrete tile roof is proper installation. Concrete tiles are tricky to put in, so it is essential to hire a qualified roofer to avoid problems with your roof down the road. Our roofing professionals know how to work with this material and will construct your concrete tile roof so that it will last for years to come. Contact us today to request a free quote for your roofing project.